All residential properties are required to have garbage, recycling and organics service which is provided by the City of Culver City's Public Works Environmental Programs and Operations Division (EPO). Contact the Environmental Programs and Operations customer service office to start service, schedule a cart exchange or to discuss billing options and more. Hours: Monday - Friday (7 a.m. - 3 p.m.). If you are calling after hours, leave a message with your name, phone and address and the office will follow-up the next business day. Sign in online to Culver City Connect with any questions, comments, suggestions or concerns. New Item: Check out the Think Green Think Culver City Winter 2019 Newsletter for information on innovative projects and programs the City is working on in your community. COMPOSTING ORGANICS IS AS EASY AS 1 -2- 3! While preparing meals or when cleaning the refrigerator, separate food scraps and always scrape any extra food from your plate into a kitchen pail. Use a kitchen pail or any compostable paper container such as take-out boxes or paper bags to collect kitchen food scraps. Include food-soiled paper such as coffee cups and filters, paper plates, napkins, paper towels, waxed/parchment paper, and paper take-out containers. Freezing food scraps or wrapping them in newspaper can prevent leaks and odors. Empty food scraps, food-soiled paper and plant debris into the green organics cart. By collecting food scraps, we’ll reduce waste and create compost for local farms and gardens. The City is offering pails for purchase that can be placed on the counter to collect food waste until you are ready to place it into your backyard compost bin or in the city's organics collection container. We suggest using a newspaper, or BPI-certified compostable liner to help keep food waste from sticking to your pail. Residents can purchase kitchen counter pails from the Environmental Programs and Operations Division. To purchase, please call 310-253-6423. The cost is $10; cash or check only. Checks must be made payable to the City of Culver City, and the price is subject to change. The City of Culver City sells discounted Soil Saver Classic Compost Bins for easy at home composting to Culver City residents. 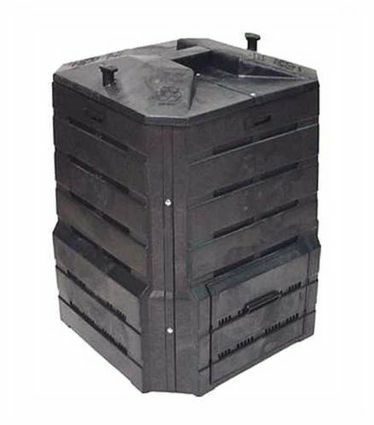 Soil Saver bins are durable, strong, and 100% made from recycled materials. Convenient lock-top to easily remove or add kitchen and garden waste. Two side-up doors for easy compost access. The cost is $70 cash or check only. Checks must be made payable to the City of Culver City, and the price is subject to change. To purchase call 310-253-6452 to make an appointment to pick-up. What goes in the BLUE recycle cart? Empty Glass, Aluminum & Metal, Plastics (1-5, 7), Beverage & Soup Boxes, Clean Paper & Cardboard. What goes in the BLACK trash cart? Non-Recyclable & Non-Hazardous Materials: broken plates, broken glass, polystyrene, foam, plastic bags, diapers, pet poop, kitty litter, incandescent light bulbs, toothpaste tubes, broken pottery, disposable razors, disposable ice-packs. Used Clothing: Donate gently worn items to a second-hand store or clothing drive. Tattered and stained clothes belong in the trash. What DOES NOT go into the Trash Cart? Do not place food scraps, recyclables, or household hazardous waste in the trash cart. Hazardous Waste in the home is commonly referred to as "Household Hazardous Waste” (HHW). Improper DISPOSAL of Hazardous waste is dangerous and ILLEGAL. Paint recycling: most paint vendors in Culver City recycle old paint. Visit paint care for details and locations near you. Collection events: LA County offers free “Too Toxic to Trash” events around the County. Permanent collection centers: open year round, residents can drop off their hazardous waste at one of the free collection centers. Contact the Environmental Programs and Operations Divisions customer service at 310-253-6400 to schedule your bulky item pickup. Monday through Friday 7 a.m. -3 p.m..
Place items at the curb by 6 am and no earlier than 1 day before your scheduled pick up date. Loose, uncontained or otherwise improperly prepared items may be subject to an additional fee. Culver City’s Mattress Recycling Program, in coordination with Bye Bye Mattress through the Mattress Recycling Council, collects unwanted mattresses and box spring foundations, sorts and loads these items onto trailers by Culver City staff at the Transfer Station. After the items are loaded a dedicated mattress recycler collects materials from the City to be recycled. City-provided containers shall be placed on the curb in front of the premises occupied by person depositing same, unless another location has been designated by the City, not earlier than sunset of the date prior to that established for collection on the particular route involved, and such containers shall be removed from the place of collection no later than midnight on the day of collection. How do I …Sign in online to Culver City Connect with any questions, comments, suggestions or concerns. Or you can call the Environmental Programs and Operations customer service office at 310-253-6400, Monday – Friday 7 a.m. - 3 p.m.
Only the 64-gallon and 96-gallon collection carts supplied by the city will be emptied. Please do not over-fill carts and do not place additional items on top of or alongside the container. Contact the Environmental Programs and Operations customer service office at 310-253-6400, Monday – Friday 7 a.m. - 3 p.m. to request additional containers. If you are calling after hours, leave a message with your name, phone number and address and the office will follow-up the next business day. Sign in online to Culver City Connect with any questions, comments, suggestions or concerns. Check the Service Rates to see what fees apply. Trash, Organics and Recycling collection schedules are not affected by any other holidays except New Year's Day and Christmas. Holiday Tree collection from 12/26 - 1/31. REMOVE all ornaments, decorations, tinsels and stand from the tree. CUT the tree into pieces, if needed to fit into green cart. PLACE the tree pieces inside the green cart and put out for regular pick-up on collection day. Or, cut taller trees to 4 feet – no flocking, ornaments or stands – and place curbside or in the alley on your scheduled pick up day for organics collection. There's also the "Park Your Tree" Program. The City will collect trees that have been dropped off at specific locations. Trees collected will be turned into compost. Flock or artificial trees cannot be composted, place them in the black container.